If you hang around poker players long enough, you will hear the term Poker Position come up quite often. When someone talks about position in poker, they are referring to when they act during the course of a hand. In it’s most basic form there are two types of position, being “in position” and being “out of position”. 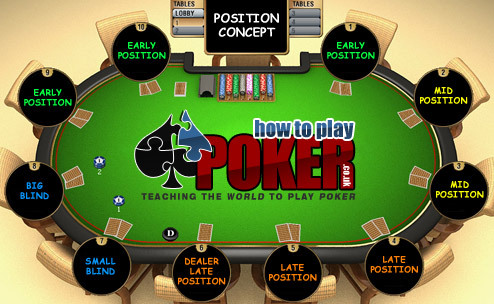 This is then broken down further into Early Position, Middle Position and Late Position and each of these positions can be determined by the seat at the table in relation to the dealer button. Players immediately to the left of the dealer button (the Blinds and Early Position) are considered to be “out of position”. They will act first or “early” in a hand before the other players. For example if you are in Early position and in a hand with another player who is in Late position, then you will have to act first on all subsequent rounds of betting. This is a significant disadvantage to you as your opponent will get to see how you act before he has to make a decision. Being out of position will make playing a hand much harder. Players immediately to the right of the dealer button (Late Position) are considered to be “in position”. They will be either last or towards last to act in every betting round. This is the opposite to being out of position and is a huge advantage for the reasons we will discuss below. Players in Mid Position are kind of stuck in the middle (hence the name!) and could either be considered in position or out of position. For the most part you should consider them out of position, however in the right circumstances with passive players to the left of you in Late Positions, you could consider Mid Positions to be in position. Why is Position in Poker Critical? The concept of position in poker is nothing new and it’s one of the fundamental aspects that any player looking to become better, should be aware of. Having position on your opponents during the course of a hand will allow you to play the hand with more options. Lets look at just some of the reasons why playing in position over your opponent gives you a huge advantage. The first key aspect of being in position is that you will be able to gain more information. Since your opponent has to act first, you get to know what they are going to do and can base your decisions accordingly. If a player checks, you can attempt to steal pots, bet for value or find out where you stand in the hand. You basically get to dictate how the hand will play out. Being last to act also grants you the opportunity to take free cards (getting to see another card without putting any further chips in the pot). If you have a drawing hand, you can also check after your opponent acting out of position checks to you. Often in poker, the player out of position will check to the person who raised, this allows you to see many free cards and possibly outdraw your opponent. When you are in position, your opponent will likely check to you when they don’t have much of a hand. For example, your opponent checks the flop and you decide to check as well. Your opponent checks again on the turn allowing you to take control of the hand. You can attempt a ton of bluffs when in position. In this example you have been able to collect more information from two rounds of betting and since a player will rarely check twice with any strength, stealing the pot in this sort of situation has a high percentage to work, thus increasing your overall winnings. A good portion of the time in poker, you will have some type of medium strength hand that will not always be easy to play. A good example would be having a second pair type hand in Texas Holdem. You think your hand is good, but you don’t want to put too much money in the pot as getting it in with second pair is never a good result and could be easily beaten. When you’re in position, you can use this advantage most of the time to keep the pot small and dictate how much goes in to the pot. With a medium strength hand, checking earlier in the hand and then betting on later streets is a good way to keep the pot small, yet at the same time getting your opponent to pay you off with a weaker hand. Since you showed weakness by checking, your opponent may attempt a bluff and you can call down, keeping the pot small and seeing a cheap showdown with your less than stellar hand. The range of starting hands you should play out of position is far less then when in position. Many hands are simply unplayable when you are out of position since the edge your opponent has on you is so great. When you are in position, you can open up the range of hands you play due to the edge you get from the many more options opened up to you during the course of a hand. One of the first things I look at when deciding to call a raise or make one myself, is what position I’m in. If I’m out of position and facing a bet, I will lean towards folding many hands that I would play when in position. It’s not worth taking a marginal hand to battle when you will be first to act during the hand. One of the more subtle ways you take advantage of position is when you first sit at a table. If you spot a weak player and you have the option, its best to sit to their left. You will have position on this player during most hands which make it much easier to make money. Being out of position does have some advantages, but not many and these are far outweighed by the disadvantages of not being in Position. You can slow play a big hand, by just calling a bet from your opponent and looking to trap them. Since a player in position is likely to bet when checked to, trapping with big hands will often work when out of position. This can allow us to call, check raise or look to lead out on later streets, throwing our opponents off. It can be a very effective way to extract money in poker, but it does take a bit of practice to master. The importance of position in poker cannot be overstated and should become one of those elements of poker that is drilled in your head. If I had to pick one topic to teach someone about poker and that would be all I could tell them, it would definitely be about position. It’s so important that if you only understood the advantages of it, you are already on the road to doing quite well at Poker.